Geneva, Switzerland, March 6, 2012—Toyota Motor Corporation (TMC) unveiled the "FT-Bh"1, a lightweight, next generation small gasoline-electric hybrid concept car, here today at the 82nd Geneva International Motor Show2. 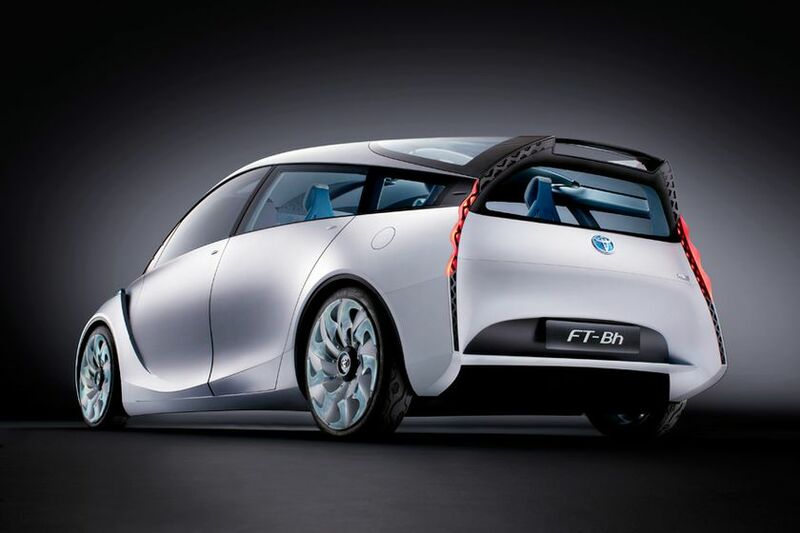 TMC, expecting hybrid vehicle use to become widespread in the second half of the 2010s, developed the FT-Bh as a B-segment, ultra fuel-efficient concept car under the theme of "ecomotion" (eco + emotion). In addition to high environmental performance, the FT-Bh aims to provide an enjoyable driving experience through highly responsive and nimble operability. By pursuing weight reduction, a more-efficient powertrain and reduced air resistance, the FT-Bh boasts a fuel efficiency of 2.1 liters per 100 kilometers under the New European Driving Cycle (NEDC), with CO2 emissions of just 49 g/km—less than half the current average for B-segment cars. Adopting a small fuel tank placed under the rear seat together with the hybrid system's lithium-ion battery gives the vehicle a low center of gravity, thus contributing to improved driving performance, which is the basic appeal of any car. In addition to the FT-Bh on display, TMC has conceived two alternative versions: a compressed natural gas (CNG) hybrid version with CO2 emissions of 38 g/km and a plug-in hybrid version with CO2 emissions of just 19 g/km. The curb weight3 of the FT-Bh is a mere 786 kg. Assuming a mass-produced fuel-efficient vehicle, the FT-Bh body structure makes greater use of high-tensile-strength steel and does not require expensive materials such as carbon fiber for weight reduction. In addition, a new high-expansion foam material is used inside the vehicle to improve interior thermal management and reduce the weight of interior components. This allows other components, including the body frame, chassis and powertrain, to be made lighter. The FT-Bh seats four adults comfortably in a body that is less than four meters long and that achieves an outstanding drag coefficient of just 0.235. The newly developed Michelin 145/55R18 tires feature a large diameter for effective road resistance reduction, and a narrow width for substantial air resistance and weight reduction. For a high level of fuel efficiency, TMC developed a new, long stroke 1.0-liter, two-cylinder Atkinson cycle gasoline engine that achieves high environmental performance with CO2 emissions of only 49 g/km under the NEDC, along with improved hybrid system efficiency. Through the application of high-expansion foam material to interior and weight reduction in the materials used for the seating and interior, the thermal capacity4 necessary for controlling cabin temperature is reduced. In addition, comprehensive thermal management measures have been implemented, such as "air-zoning" that adjusts temperature only in necessary areas depending on the number of passengers. Due to small amount of heat generated by high-efficiency engines, heat from both the engine and exhaust is used for heating the interior. Power consumption in the FT-Bh has been cut to half that of standard B-segment cars. The adoption of LEDs in the head, tail and room lights, and reduction of standby power requirements necessary for electrical components such as power windows has substantially reduced overall power consumption. Styled under the theme "ecomotion", the FT-Bh boasts a new design that evokes an image of the flowing wind and realizes a high level of aerodynamic performance. The form of the FT-Bh pursues aerodynamic performance. The bullet-shaped body features sleek, tapered proportions achieved by merging the long roof seamlessly with the protruding windshield, along with narrow pillars that maintain high visibility. Inheriting elements of Toyota's next-generation "Keen Look"5 styling, the vehicle's front features vertical lamps integrated into the fenders and a large lower grille that has both streamlining and cooling effects. The tapered rear body and slightly concaved rear-end further reduce air resistance. The interior design concept features air zoning as well as an emotionally expressive design produced through the "tensional force" of tautly stretched fabric. Interior upholstery makes use of light and breathable materials, contributing to effective interior temperature management. The ultra-thin shell seats bring a more comfortable ride along with more rear legroom. Safety-enhancement features include a center display located deep in the dashboard that shows rear views from three body-mounted cameras, and a rear-view mirror with an ambient superimposed display6 that provides information and warnings concerning vehicles reflected in the mirror and also other driver-targeted information. 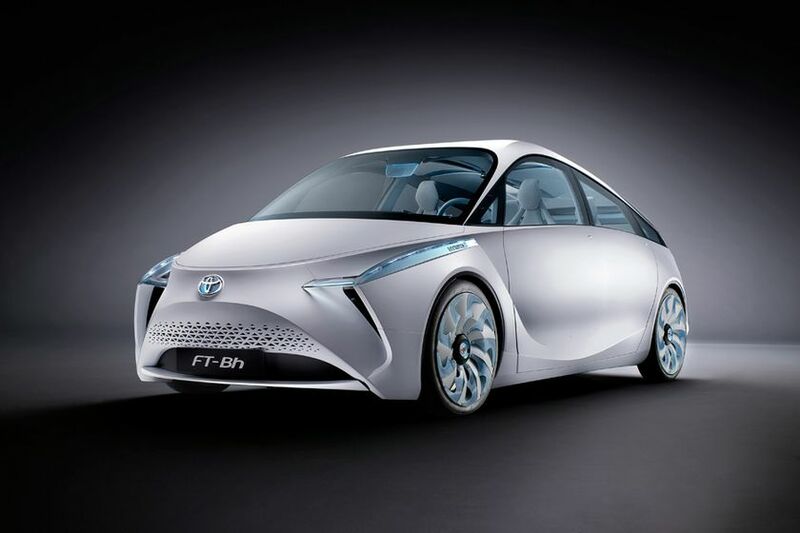 In addition to the FT-Bh world premiere, the Toyota booth at the Geneva Motor Show features four vehicles in their European premiere: the next-generation four-door "Toyota NS4" concept, the "FCV-R" next-generation fuel-cell hybrid sedan concept, the "Toyota diji" mobile-information-hub concept, and the rear-wheel-drive compact sports car "GT 86". Also on display are vehicles soon to be launched in the European market, including the "Yaris Hybrid" and "Prius Plug-in Hybrid". 1Derived from "Future Toyota B-segment Hybrid"